For many parents, seeing an infant's eyes rolling for the first time can be a worrisome experience, capable of raising both eyebrows and blood pressure. Eye rolling in infants may be normal, but it could also be a sign of a potentially serious health condition. Learn the facts about eye rolling in infants, including possible causes and symptoms, as well as knowing when you should seek out your baby's doctor. Like many other body systems at birth, your infant's underdeveloped vision system takes additional time to fully mature and function properly. According to Dr. Alan Slater, associate psychology professor at the University of Exeter and contributing author for "Blackwell Handbook of Infant Development," infant eyesight during the first month following birth is generally estimated to be about 20/600, a far cry from the 20/20 vision that most adults have. In general, your newborn can focus up to a distance of approximately 8 to 12 inches, which is just far enough for him to be able to see and focus on your face when you're holding him. Your infant's eyesight matures over time as his brain and eyes develop the ability to communicate more effectively. Instances of eye rolling in infants often occur naturally as a part of normal development. When your infant drifts off to sleep, you may notice slow eye rolling as she opens and closes her eyes repeatedly. 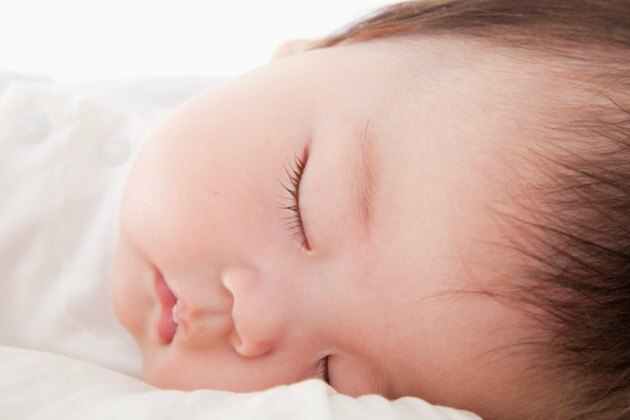 According to Dr. Richard Ferber, director of the Pediatric Sleep Disorder Center at Children's Hospital Boston and coauthor of "Principles and Practice of Pediatric Sleep Medicine," this type of normal eye rolling can develop when your infant is awake, drowsy or transitioning between sleep and wakefulness. Serious causes of infantile eye rolling include head injuries, seizures and hypoglycemia or low blood sugar. Infants experiencing normal eye rolling typically won't show other signs or symptoms that something is amiss. But if your infant's eye rolling is related to a serious problem, he'll generally reveal other symptoms. Depending upon the cause, neurological symptoms, such as trembling, shivering or convulsions, often accompany abnormal eye rolling. Other signs that you need to make a prompt call to your infant's doctor include rapid or jerky movements on one or both sides of the body, sudden changes in skin color, irregular breathing, excessive irritability and prolonged crying. Careful, frequent observation serves as one of the most important ways to determine if your infant's eye rolling is serious or not. Consider keeping a daily log on your infant's eye-rolling habit. This will help you pinpoint exactly when your infant does it, as well as what other behaviors or symptoms accompany the eye-rolling. Does she do it at a certain time of day? Are there other neurological symptoms or troublesome signs that accompany the eye rolling? Above all, trust your gut; if you believe your baby's eye rolling is unusual or you notice other signs that something is amiss, contact your pediatrician promptly. If your baby's eye rolling is accompanied by limb stiffening or other seizure signs--such as jerky body movements and crying--then you'll need to take special care to ensure that your infant doesn't get hurt. Seizures in infants can arise from multiple causes, including fevers, infections and epilepsy, and require prompt, effective measures to minimize potential harm to your baby. Loosen any tight clothing and allow your baby to move freely during the seizure, preferably in a large, flat area, such as your floor. Turn him on his side to help keep him from choking if he develops excessive fluid buildup in his mouth or vomits. Take your infant to your pediatrician or the emergency room immediately after the seizure for testing and diagnosis to determine the cause.